Last week temperatures were 8-12 degrees above-normal. Precipitation has ranged from less than ¼“ to over 4”. Base 50 growing degree-days ranged from 110-170. A strong cold front will move through Friday into Friday evening, with cooler temperatures to follow. Today temperatures will in the upper 60s and 70s with partly sunny skies. Overnight lows will be in the mid 50s to low 60s with a few light showers possible. Friday will be in the upper 70s to 80s with showers and thunderstorms possible Friday into Friday night with a frontal passage; some storms could be severe and there is a chance for flash flooding and gusty winds. Overnight temperatures will be in the upper 40s to low 60s. Saturday a few morning showers are possible, then a mostly dry day with temperatures in the upper 50s to near 70s. Overnight temperatures will be in the upper 40s. Sunday highs will be in the 60s to mid 70s. Overnight temperatures will be in the mid 40s to low 50s. Monday temperatures will be in the 60s to mid 70s with a chance of afternoon showers. Overnight temperatures will be in the 50s. Tuesday highs will be in the 70s. Overnight temperatures will be in the 50s with overnight showers possible. Wednesday highs will be in the 70s with showers possible. Overnight temperatures will be in the 50s. The seven-day precipitation amounts will range from an inch to near 3 inches. The 8-14 day outlook (Sept 26-Oct 2) slightly favors below-normal temperatures for western and northern areas and slightly favors above-normal precipitation for western, central, and northern to eastern NY. Last week temperatures were within 2 degrees of normal. Precipitation has ranged from ¼ “ to over 3”. Base 50 growing degree-days ranged from 40-120. Scattered showers Thursday into Friday, dry for the weekend. Moisture from Hurricane Florence to reach NY next week?? Today temperatures will in the 70s to low 80s, with scattered showers and isolated thunderstorms. Localized heavy downpours are possible. Overnight lows will be in the low to mid 60s. Friday will be in the 70s to mid 80 with scattered afternoon showers and thunderstorms. Overnight temperatures will be in the low to mid 60s. Saturday will be dry with temperatures in the mid 70s to mid 80s. Just a slight chance of afternoon showers. Overnight temperatures will be in the upper 50s to mid 60s. Sunday highs will be in the mid 70s to mid 80s with continued dry conditions. Overnight temperatures will be in the upper 50s to mid 60s. Monday temperatures will be in the 70s. Precipitation is questionable due to Hurricane Florence. Overnight temperatures will be in the 60s. Tuesday highs will be in the 70s. Precipitation is questionable due to Hurricane Florence. Overnight temperatures will be in the 60s. Wednesday highs will be in the 60s to low 70s. Precipitation is questionable due to Hurricane Florence. Overnight temperatures will be in the 60s. The seven-day precipitation amounts will range from an inch to over three inches. Highly dependent on track of moisture from Hurricane Florence. The 8-14 day outlook (Sept 20-26) slightly favors below-normal temperatures for part of the state and slightly favors above-normal precipitation for western to central NY. Last week temperatures were 2 to 6+ degrees above-normal. Precipitation has ranged from a trace to over 1”. Base 50 growing degree-days ranged from 80-160. Cooler temperatures to finish the week! Scattered showers possible over the holiday weekend with hot and humid temperatures returning next week. Today temperatures will be much cooler for most areas, in the upper 60s to lower 80s with lower humidity. Eastern NY will still be warm and humid for part of the day until the cold front exits. Some showers and thunderstorms, associated with the front, will be possible. Overnight lows will be in the 50s to near 60, some upper 40s. Friday will be in the 70s with scattered afternoon showers and thunderstorms. Overnight temperatures will be in the 50s to 60s. Saturday temperatures will be in the mid 60s to low 80s, with a chance for afternoon/evening showers and thunderstorms. Overnight temperatures will be in the upper 50s to 60s. Sunday highs will be in the mid 70s to mid 80s with a chance for afternoon/evening showers and thunderstorms. Overnight temperatures will be in the upper 50s and 60s. Monday temperatures will be in the 80s with a chance for afternoon/evening showers and thunderstorms. Overnight temperatures will be in the 60s. Tuesday highs will be in the 80s to low 90s with a chance for afternoon/evening showers and thunderstorms. Overnight temperatures will be in the 60s. Wednesday highs will be in the 80s to low 90s with continued muggy conditions and a chance of showers. Overnight temperatures will be in the 60s. The seven-day precipitation amounts will range from a quarter inch to one and a half inches. The 8-14 day outlook (Sept 5 – 11) favors above-normal temperatures and above-normal precipitation for the the state. Last week temperatures were near normal to 4 degrees above-normal. Precipitation has ranged from less than ½ “ to over 4”, isolated areas saw over 8” with flooding. 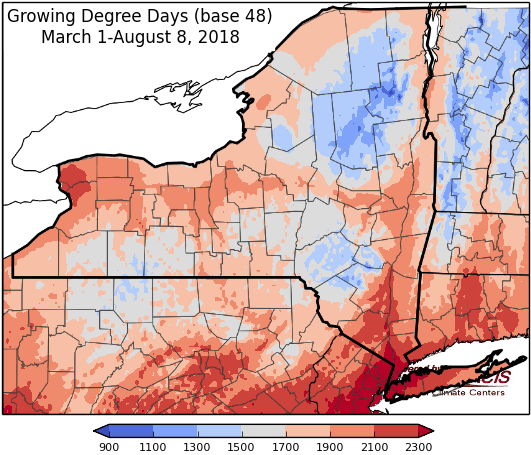 Base 50 growing degree-days ranged from 110-170. Moderate drought continues in part of western and northern NY. Showers and thunderstorms Thursday and Friday, drying out for the weekend into next week until unsettled weather returns on Tuesday. Today temperatures will be in the upper 70s and 80s with showers and thunderstorms in the afternoon in western areas and moving east throughout the evening. There is a potential for heavy downpours and localized flooding. Overnight lows will be in the upper 50s to near 70 with a cold front bringing a chance of showers and thunderstorms. Friday will be humid with temperatures in the 70 to mid 80s with scattered showers and thunderstorms continuing. Some sever weather is possible, including heavy rain, flash flooding, and gusty winds. Overnight temperatures will be in the mid 50s to mid 60s. Saturday temperatures will be in the mid 70s and 80s, with lingering morning showers, especially in eastern NY. Some isolated afternoon showers are possible. Overnight temperatures will be in the low 50s to mid 60s and less humid. Sunday highs will be in the mid 70s and 80s with mostly dry conditions, an isolated afternoon shower is possible. Overnight temperatures will be in the mid 50s to mid 60s. Monday temperatures will be in the mid 70s to mid 80s with dry conditions. Overnight temperatures will be in the mid 50s to mid 60s. Tuesday highs will be in the mid 70s to low 80s. Overnight temperatures will be in the 60s. A cold front will bring scattered showers and thunderstorms Tuesday into Wednesday. Wednesday highs will be in the 80s with continuing showers. Overnight temperatures will be in the 60s. The seven-day precipitation amounts will range from one inch up to two and a half inches. Locally heavy rainfall next week will increase these amounts for some areas. The 8-14 day outlook (Aug 23-29) favors above-normal temperatures for all of the state and slightly favors above-normal precipitation for most of the state, excluding part of southeast NY. Last week temperatures were 4-8 degrees above-normal. Precipitation has ranged from less than ½ “ to over 4”, with an additional tenth to 2” over the last 24 hours. 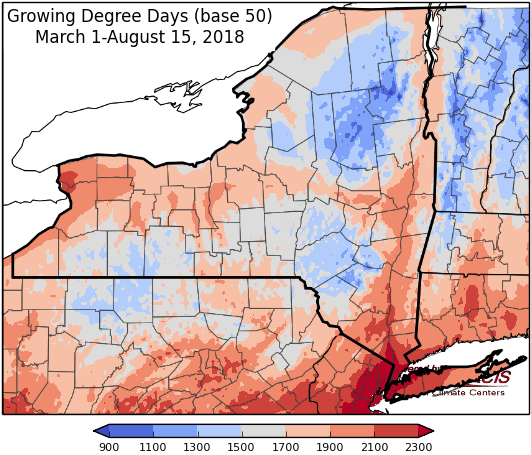 Base 50 growing degree-days ranged from 130-190. Moderate drought continues in part of western and northern NY; conditions improved in Otsego & Schoharie. Seasonable temperatures, only scattered showers and thunderstorms till next week when heavy rain is possible. Today temperatures will be in the upper 70s and 80s with mostly dry conditions after morning showers move out, humid conditions will linger. Overnight lows will be in the upper 50s to upper 60s with a cold front bringing a chance of showers and thunderstorms. Friday highs will be in the mid 70s to mid 80s with scattered showers and thunderstorms and lower humidity. Overnight temperatures will be in the mid 50s to near 60. Saturday temperatures will be in the mid 70s to low 80s, it will be a mostly dry day with some scattered showers and thunderstorms. Overnight temperatures will be in the mid 50s to low 60s. Sunday highs will be in the mid 70s to mid 80s with mostly dry conditions, an isolated afternoon shower or thunderstorm is possible. Overnight temperatures will be in the low to mid 60s. Monday temperatures will be in the mid 70s to mid 80s with widespread showers and thunderstorms in the afternoon. Overnight temperatures will be in the 60s. Tuesday highs will be in the mid 70s to low 80s with showers and thunderstorms likely, with heavy rainfall possible. Overnight temperatures will be in the 60s. Wednesday highs will be in the 80s with high humidity and lingering showers. Overnight temperatures will be in the 60s. The seven-day precipitation amounts will range from half an inch to one inch for most of the state, up to 2” in southeast NY. Locally heavy rainfall next week will increase these amounts for some areas. The 8-14 day outlook (Aug 16-27) favors above-normal temperatures for all of the state and favors above-normal precipitation for most of the state, excluding part of southeast NY.